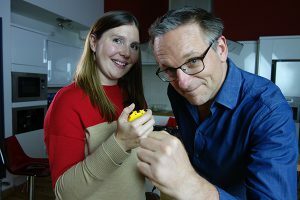 Our super-busy but media-friendly researchers over at the Division of Medical Sciences and Graduate Medicine in Derby have been making television again with TV doctor Michael Mosley and his BBC crew. 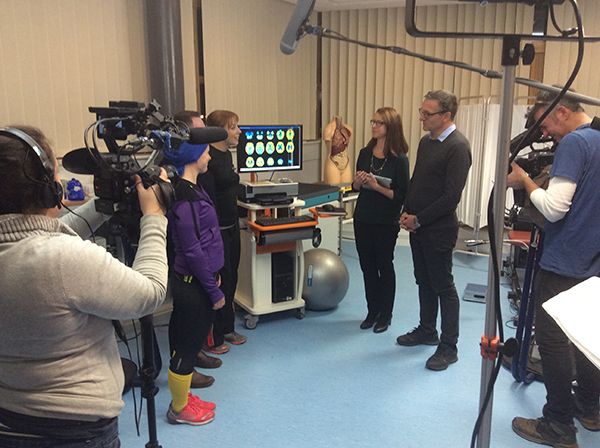 The BBC team has returned to our Medical School site at Derby to make part of a new programme called ‘The Truth About Getting Fit’. The show airs on BBC One at 8pm on Wednesday 31st January. The producers were put in touch with our resident cannabis expert, Dr Saoirse O’Sullivan, on a previous visit to Derby to film for BBC Trust Me I’m A Doctor. 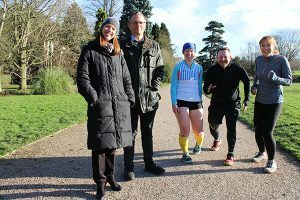 Using her expertise, the task was set to find out what causes the so-called ‘runner’s high’ experienced by some people after exercise. The BBC team filmed Saoirse and her research colleague Dr Daniel Couch carrying out a mini-trial to test the theory about endocannabinoids. 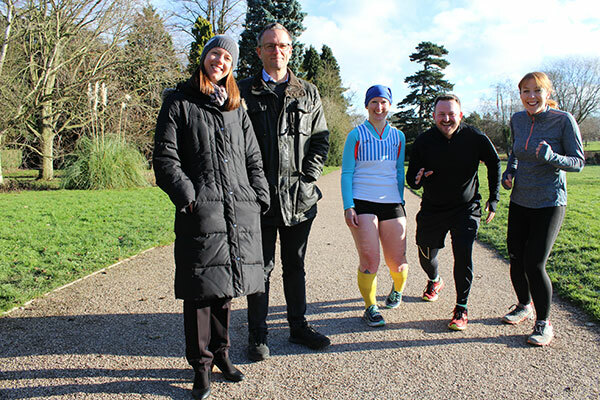 They recruited three volunteers from local running clubs who did a 30 minute run in Markeaton Park in Derby. Small blood samples were taken before their run, immediately after the run and also at 15 minutes and 1 hour afterwards. 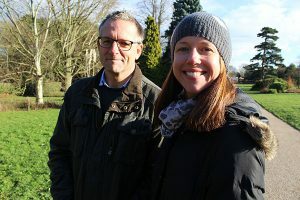 Professor Dave Barrett and Dr Catherine Ortori in the University of Nottingham’s School of Pharmacy analysed the samples for changes in levels of endocannabinoids. Regarding the filming of the BBC documentary, Saoirse said: “I found the whole process really interesting! It’s amazing how much work and filming goes into producing a small segment of television. I was surprised at how many times we would film a particular conversation from different angles and with different emphases, and I was really impressed with how the producers seemed to be visualizing exactly what it would end up looking like, and what they needed to do to create that look. At first it was daunting knowing that the cameras were on you, but it became easier to relax and talk more naturally. It’s definitely something I would like to do again. 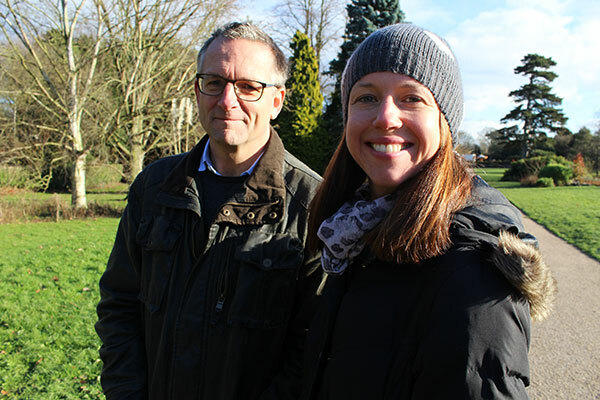 Also featuring in Wednesday’s The Truth About Getting Fit programme is musculoskeletal researcher Dr Beth Phillips, who has previously featured in Michael Mosley’s Trust Me, I’m a Doctor series. 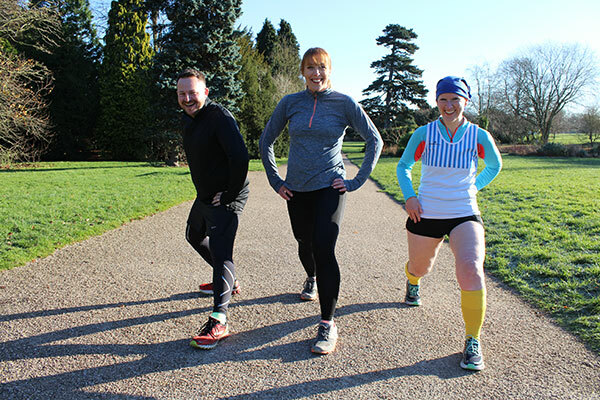 This time Beth stepped up to put Michael through his paces with a set of high-intensity exercises she has devised based on squats, star jumps and running on the spot to get the maximum benefit in a short amount of time. In the programme, Beth takes Michael Mosley through a simple, 15-minute home-based HIIT protocol that requires no equipment which has been shown to improve fitness in just 4-weeks (with 3 sessions each week). This protocol consists of five 1-minute bursts of star jumps, squats and static sprints (then repeated squats and star jumps to make a total of five bursts) with 90 seconds recovery between each. Including a warm-up and recovery phase each session can be completed in 15-minutes in the home-environment, overcoming some of the potential barriers to exercise-for-health. 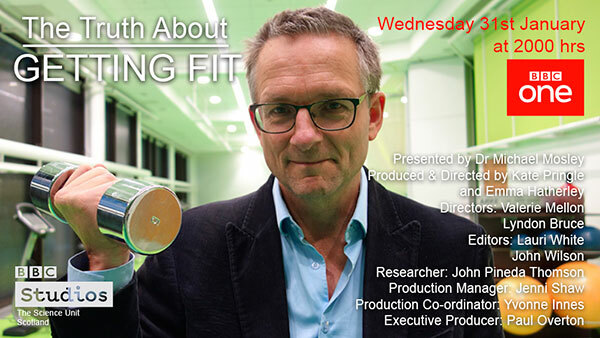 The results are revealed on BBC One at 8pm on Wednesday in The Truth About Getting Fit. A preview of Beth putting Michael through his paces is available here.